VIP Admission - BEST VALUE! Includes everything with General Admission tickets PLUS an hour early entry (8pm) and an incredible 5-hour open bar from 8pm to 2am!! Includes everything with VIP Tickets PLUS Reserved Seating with Waitress Service all night long, and a Bottle of Champagne per 4 people -- 4+ people required to purchase this package. LIMITED LIMITED TABLES AVAILABLE. Purchase this ticket if you need to add on to an existing table. Includes everything listed with normal VIP Reserved Seating tickets. DO NOT purchase this for ticket for new tables - your order will be canceled. You are REQUIRED to enter the order # and purchaser name for the original table purchase at check out. 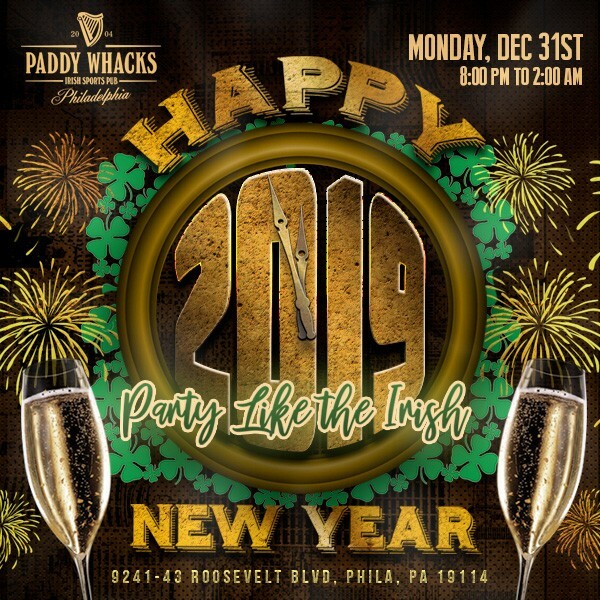 Enjoy New Year's Eve at Paddy Whacks Northeast Philly - we will have everything you need to kick off the New Year in the most proper way! Please Note: This event is at Paddy Whacks Northeast Philly - NOT on South Street! Paddy Whacks aims to serve the social dining and entertainment needs of all members of the community young and old. It is a place to meet, laugh, hear music, relax or Dance the night away. In short Paddy Whacks has a culture of its own, intergrading the rich traditions of a pub into the heart of the community. View More Events Organized by Paddy Whacks. This event is organized by Paddy Whacks.